The Kapamilya hit reality singing competition "The Voice of the Philippines" gave rise to another heartthrob singer. He is no other than, Jacob Benedicto. 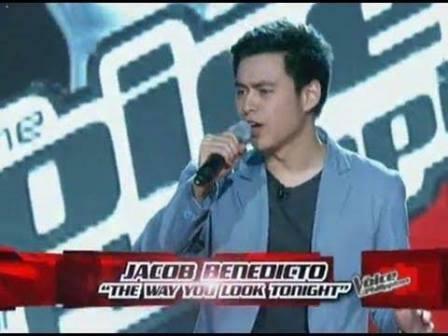 Blessed not only with a good look, Jacob impressed the judges of the singing contest during his blind audition. With his version of the Michael Buble "The Way You Look Tonight," Jacob captured the attention of the four judges namely Lea Salonga, Bamboo, Apl.De.Ap., and Sarah Geronimo. Prior to Jacob's audition to the reality show, he made his own version of the classic love song "Kailan" which was used in the John Lloyd Cruz-Sarah Geronimo movie "It Takes a Man and a Woman." "Channeling my inner John Lloyd Cruz hahaha! I couldn't stop singing this song after watching "It Takes a Man and a Woman" so I decided to record it just for fun. Its definitely not perfect obviously I was reading the lyrics off my laptop. Enjoy!"